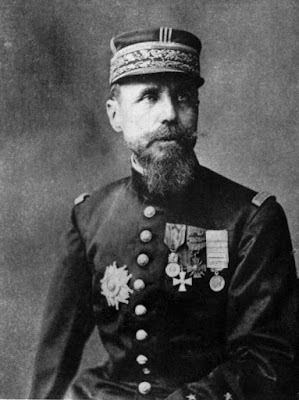 French General Henri Gouraud is most well-known for commanding the Fourth Army on the Western Front in 1918. He brilliantly used an "elastic defense" to stop the last great German offensive in World War One (15 July 1918). The American 42nd Rainbow Division was attached to Gouraud's army where it held a key part of the line. He seemed almost to be the reincarnation of the legendary figure of battle and romance, Henry of Navarre. And he was as good as he looked. I have known all of the modern French commanders, and many were great by any standards, but he was the greatest of them all. Petain and Foch rank with the best of any era, but Petain always exaggerated the enemy potential and thereby failed to exploit fully his successes, and Foch was too inflexible once he had outlined a plan, and consequently missed opportunities. But Gouraud was without a weakness. In your breasts beat the brave and strong hearts of free men. None shall look to the rear; none shall yield a step. Each shall have but one thought: to kill, to kill, until they [the Boche] have had their fill. Therefore you General says to you: You will break this assault and it will be a happy day. Awake, Saladin. We have returned. My presence here consecrates the victory of the Cross over the Crescent. Alas, they don't make Frenchmen like this anymore. Most of the best died in the World Wars. The socialist-globalist refuse are now eagerly surrendering their country (and the entire West) to Saladin's progeny. Let's hope the Yellow Vests can save their nation, and therefore, the West before it's too late.